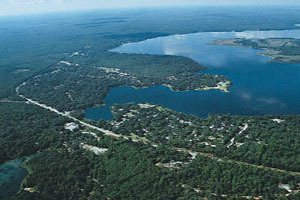 Salt Springs Village, on the eastern shore of Lake Kerr, is surrounded by the Ocala National Forest, preserving the natural beauty of the area. Lake Kerr is just one of many freshwater lakes that are ideal for fishing, boating, and swimming. Salt Springs Village is located in Marion County, just 28 miles from downtown Ocala in the Ocala National Forest. Temperatures average a comfortable 74 degrees in the winter and 82 degrees in the summer. To enjoy low-cost living in the quiet, natural surroundings of Salt Springs Village, call toll-free 1-877-536-7480. Click here for a map and driving directions to Salt Springs Village. For more information about Marion County, Ocala, and the Ocala National Forest, click on any of the links below.